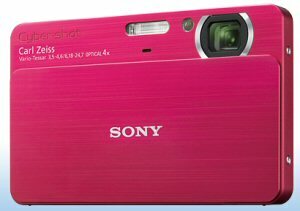 Sony has launched a new thin Cyber-shot point-and-shoot 10-megapixel DSC T700Â cameraÂ with 4GB of internal memory. Internal storage is convenient if for some reason you forget to carry a memory card. Sony claims that the internal memory in the DSC T700 can store 1,000 full-resolution or 40,000 VGA-quality photos. If you want more storage, you can use the optional Memory Stick media card. The DSC T700 comes with a Carl Zeiss lens that integrates a 4x optical zoom andÂ image stabilization. The camera has a 3.5-inch, wide touch panel Xtra Fine LCD screen for photo-like viewing (210 pixel-per-inch resolution) with high contrast and wide-angle viewing. At a little over 5/8 of an inch, the DSC T700Â is thin enough to carry in a pocket or purse. Priced at $400, the DSC-T700 cameras will be available in late September in red, champagne gold, pink, dark gray and silver colors. One Response to "Sony Debuts New Camera with 4GB Internal Storage"